Priscilla Chan named winner for her work advocating for education and children's health care initiatives. The School of Economics and Business Administration at Saint Mary's College of California founded the Visionary of the Year Award in partnership with the San Francisco Chronicle. Visionary leaders are paradigm changers -- individuals who strive to make the world a better place by employing new, innovative business models and practices. As the world faces an increasing number of widespread social and economic challenges, visionary leaders understand the broad impact of the business community and recognize its potential to drive great change. As part of the Visionary of the Year campaign, SEBA offers a scholarship to an incoming graduate student who exemplifies the entrepreneurial spirit of the Visionary of the Year Award and its winner. 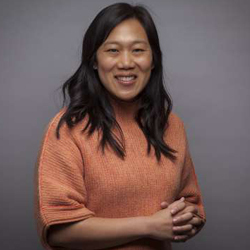 Priscilla Chan, winner of the 2017 Visionary of the Year Award, is Founder & CEO of The Primary School and Co-Founder of Chan Zuckerberg Initiative. Read about all the 2017 Visionary the Year nominees. The third Visionary of the Year scholarship was awarded to Hamid Farhad. New this year: The San Francisco Chronicle's editorial page editor, John Diaz, brought a panel of select nominees to Saint Mary's College on April 27th to discuss how innovative leaders can inspire and create positive social change. Watch the video below. Chase Adam, winner of the 2016 Visionary of the Year award, is creator of Watsi, a San Francisco-based crowdfunded medical care platform for impoverished people in developing countries around the world. Read about the 2016 event and view the photo gallery. The second Visionary of the Year scholarship was awarded to Blake Cairney. Evan Marwell, winner of the 2015 Visionary of the Year award, is founder of Education Superhighway, which aims to upgrade internet access in the nation’s public school classrooms. Read about the 2015 event and view the photo gallery. The first Visionary of the Year scholarship was awarded to Anita Engles.